So you can see from the description that I am supposed to sing my own praises. I like to sing other people’s praises. I find self-deprecating behavior so much easier. I am my own worst critic. So I will start this post by singing others’ praises and we’ll see if I get around to the “tooting my own horn” part. 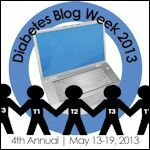 I was so excited to be a part of Diabetes Blog Week. I have only found a few other D-blogs even though I knew there were others out there. I just haven’t had time to find them. Being a D-mom can be lonely. You feel isolated. You feel like no one really knows what you go through on a daily, no make that hourly, basis. And if you do it well, make it look too easy, others really don’t know what you go through. So I couldn’t wait to find other D-moms to commiserate, and at times, celebrate with. Around mid-morning at work I decided to check my personal email. Sometimes Medium’s school nurse emails me with questions or just FYI’s so I like to check it every so often. I couldn’t believe my eyes….several comments from other D-bloggers! I have had more hits today than ever before, I even had someone from Pakistan visit my blog! I’m international! And even though I started this blog for myself and to vent my feelings for myself, I have to admit, it is exciting and rewarding to know that others are reading and may be inspired, entertained, (or infuriated, as the case may be) by my words. And I have over a hundred new blogs to work my way through now! I can’t wait! So I promised to try and pimp myself out a bit, so here goes. I am a great FAKE nurse. I have a Bachelor’s degree (not in nursing) and worked a fancy corporate job back in the day, but quickly ditched the pantyhose (yes, we still wore pantyhose in those days) for poopy diapers when Large was born. By the time Medium came around 2 years later, I was desperate to use my brain for something other than nap time nursery rhymes and stimulating toddler talk. So I got a job as a Unit Secretary in an Emergency Room. I. LOVED. IT. I got to be near the action, but no one was going to die if I didn’t fax the correct piece of paper. I worked there for 9 years until a year ago when I went to work in the IT department for the same health system (it was time to start making a little more money for my time). I sat next to the ER doctors and nurses for 12 hours at a time learning from them. That has proven to be great training for being a D-mom. So I do a pretty good job at all the nursey stuff that comes with having a D-kid (and there is a lot of it!) And while my time in the ER has given me more medical knowledge and experience than the average bear, I, in no way, compare to the true greatness that is a REAL nurse!